Blood Stains that will Never Wash Away…. The owner tries to clean up the massive amount of blood. shortly after the shooting show that there was a lot of blood. The photographs show that the hotel owner was trying to clean up, and he seemed to be using very basic methods. What my neighbor was not told was that the square with the bloodstain was removed after the tragedy and later replaced. The Vistor FAQ’s page from the National Civil Rights Museum web site explains. 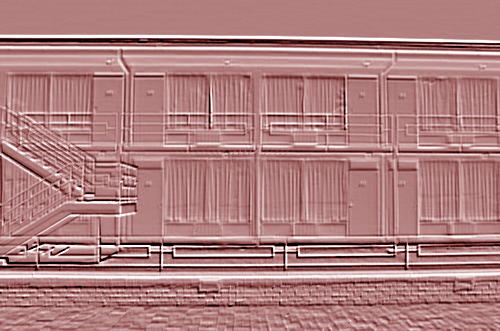 Is it true that a square of concrete on the balcony once contained the blood of Dr. King? Yes. Soon after the tragic shooting, many community people set about to preserve and in some cases remove distasteful evidence of the crime. 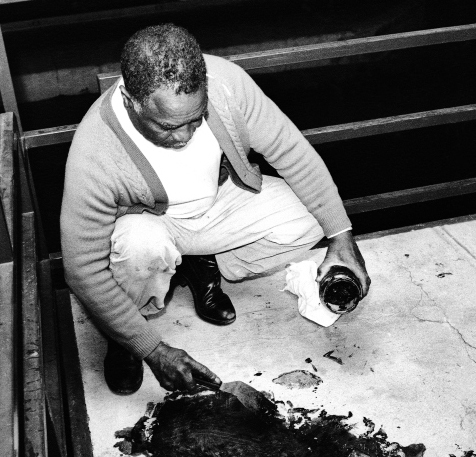 One such effort involved the removal of a concrete square on the balcony with the bloodstains from Dr. King. Later that square was replaced. If the square were protected from the elements, as indeed the square that was returned now is, it would explain why blood stains have been preserved for all this time. The square was not outside for many years, and when returned was covered with some sort of plastic or glass covering. Certainly it makes sense that with such a quantity of blood that some of it would have been difficult to remove, and replacing the square of porous concrete would have been the only choice if the hotel room was going to be used again. However, the guide implied to my neighbor paranormal and spiritual forces were keeping the stain forever in place despite the best efforts to remove them. The stain will never wash out, but serves as a symbol of the memory is also always with us. My in laws once owned a very old home that was used as make shift hospital during the Civil War. The one upstairs bedroom had blood stains in the wood that would “never clean”. The brownish stains make sense, they seemed to be around an area used as an operating theater, but given the porous nature of wood I imagine that the blood had soaked through and removal would be the only option to truly get rid of the stain. It’s the nature of the things involved, wood and blood, rather than the supernatural (the place was of course reputed to be haunted, though I never noticed anything), that explained the now dark brown stains. A house, hotel, or even Capitol with blood stains has to be haunted right? Blood, as any parent that has done laundry can tell you, is very difficult to remove. Blood, even when you can’t see it is still detectable, as any viewer of CSI shows knows. A modern investigation of the Lizzie Borden house in Fall River Mass with Luminol still showed where blood had flowed, especially where it had soaked into floorboards. My brother worked several summers at the Capitol in Washington DC, as he put it “changing lightbulbs”. It was his college summer job. I would sometimes wander over to visit, in those days you could wander around most government buildings in DC without anyone questioning you. I always enjoyed looking at one of many supposedly haunted spots in the Capitol. Don’t walk here with your press card showing! Not a good way to settle a disagreement, it’s hard on the cleaning staff. One haunted spot, is on a stairway with “bloody stains that will never wash out”. Since the stairs are made of marble, a very porous material, it is not very surprising that the blood stains have not washed out. 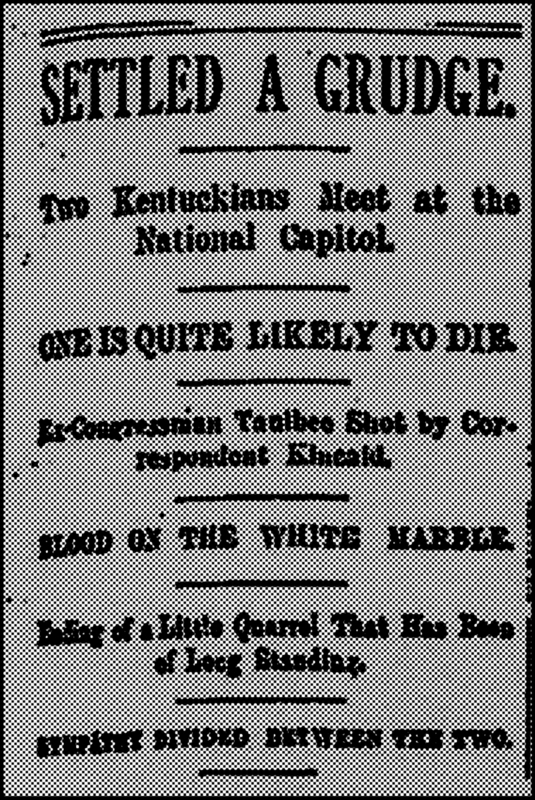 1890 saw a fight between former Congressman William Taulbee and journalist Charles Kincaid on the stairway leading to the House gallery. Taulbee had a few problems with some stories Kincaid had written. The end result was Kincaid shot Taulbee dead. To this day the blood stains are still to be seen. Also reported, journalists often stumble on the stairway. Taulbee is supposed to be haunting the spot waiting for any member of the profession that he felt truly treated him badly via the printed page and the wrong end of a revolver. I offer this site for help for the Capitol cleaning crew. 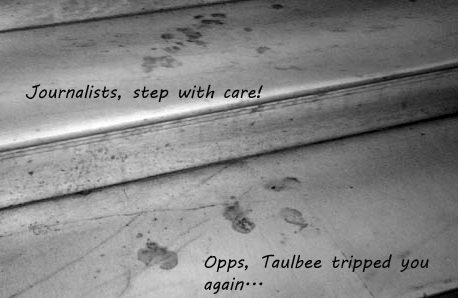 Reading about cleaning blood from marble, I think the advice to “treat quickly before the stain sets” means that the blood stains of Taulbee will forever stay just where they are. It’s not paranormal, it’s the nature of marble, wood and blood to stay together. The myth that “blood that will never wash out” means a site is haunted, might indicate that my laundry room is full of ghosts. I had two tom boy daughters that were constantly scraping knees and hands, and bumping noses. I never figured out how to get the blood stains out of their clothing. My daughter was proud to wear her very bloodied knee pads when playing soccer in Middle School, it was almost a badge of honor for her. That was good as I never could figure out how to get then white again. Blood stains sometimes just mean blood is tough to get off of anything it gets on. Meanwhile, as long as the word “blood” conjures up a shiver, blood stains will keep conjuring up ghosts. I have been told it is so inspiring to visit this now museum. It is on list of things I must do! People who believe that blood which never washes out is somehow paranormal have evidently never had children – perhaps an example of evolution in action. LOL 🙂 Really interesting article. You are sooo right that as long as the word “blood” conjures up a shiver, blood stains will keep conjuring up ghosts.Thank you for posting! Greets!